In this online and digitalized world, peoples prefer to book taxi services via their smartphones for their outstation works. The demand for the cab booking development services increasing daily, so we developed Cab Booking Android App for the entrepreneurs to start their own taxi booking business and earn high profit. This app will completely reduce your initial cost to develop the application. We will provide the separate profile for users, admin, and driver. All will get benefits from our android application. The user needs to register with the valid email address, the password for the booking and can book the car in three ways such as point to point, hourly rental, and outstation. After selecting the booking type, need to select pickup and drop location. The book now option is the present right side of the application, by clicking book now option, booking can be sent with the current date, current time and can enjoy the ride. 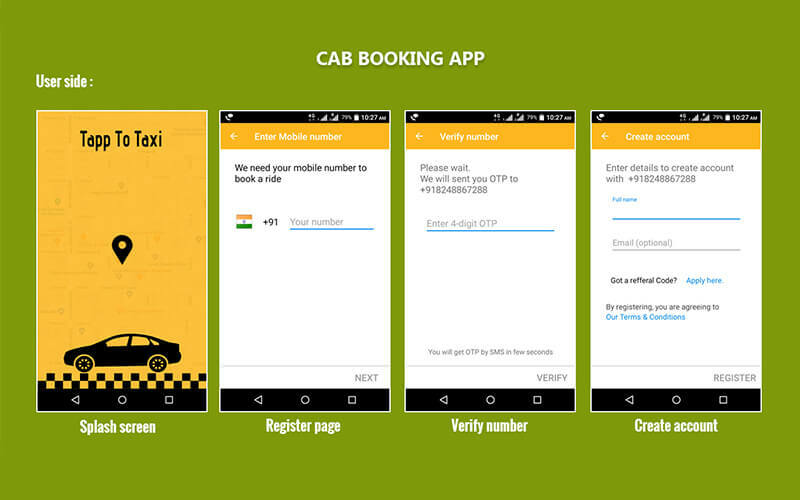 The booking option in our Android Taxi Booking App is user-friendly and simple to use. The visitor can see the previous ride by clicking ride history button in home page or in navigation screen and also can give the rating and feedback for the ride. The driver can accept or reject the passenger ride according to the distance time frame. After accepting, the driver will get the details of the pickup location to take the passenger. Through the admin dashboard, the owner can easily manage and handle the drivers, vehicles, and customers. The admin can also see the statistics and overview of the performance and operations. The main features of our Android App for Ola Cabs Clone are book now and book later option, secure sign in and sign out option, reviews and ratings, different payment option, various types of vehicle selection, real-time tracking option, notifications, admin dashboard, navigation, profile and history management, and many more. We provide you the complete taxi booking clone that is ready to start the business, and we also customize the application according to the client needs and business requirements. This cab booking clone is developed in java language with high standard code quality. We are the leading Web development company and provide different types of android app clone project to the clients at cheap price with best quality. We have experienced and professional teams that will help you take the cab booking business to the next level by implementing the new technologies and features. Register with OTP verification, Referral code, Ride Now & Ride Later options, 3 Type of booking option, Manage Rides, Rate card & Support, Booking management, Location map, Driver details, Rating options. Cab Booking Android App makes me popular in the taxi field. By using this, my status grows and touches the best level. This App running marvelous as per my need. Much more clarity in user interface for the customers to use. Thankful to the team who guides me for using this App in the way to success. I bought this App for the cab booking through online. I like this script because everything through online is easy and in the way, it is profitable due to this App’s extra-ordinary interface.